[prMac.com] Xi'an, China - GameInLife today is proud to announce the release and immediate availability of Color Rush 1.0, their colorful and fast-paced arcade game for iPhone, iPad, iPod touch devices. 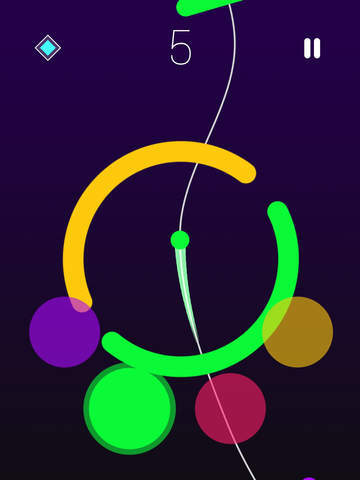 Color Rush challenges players by testing their color awareness, alertness, and fast reflexes with its fast moving, color-based challenge. As the ball travels toward the next colorful obstacle, players must quickly tap of the correct button of the matching color in order to make it past the upcoming barrier. Color Rush is based on a deceivingly simple concept. Tap the button whose color matches that of the obstacle that the ball is headed toward, that's all it takes. Tap the right button, and it's on to the next barrier. If only it were as easy as it sounds. The challenge quickly increases, as players are met with an ever-quickening pace, as well as deliciously aggravating twists and turns presented by the obstacles they must work past. The obstacles morph from straight lines, into spinning circles, twirling lines, loop-the-loops, and other challenging shapes, so the right choice of color quickly becomes a split-second reflex-based decision. "We designed Color Rush to be a game that can be learned in just a few minutes, but will provide a constant challenge to a player's reflexes," says Eric Ge, of GameInLife. "We loved the idea of taking a simple concept such as a color matching game, and turning it on its head by adding fast-moving, twisting and turning obstacles so the player is never quite sure which button to push until almost the last moment. We know everyone who plays the game will keep coming back for more!" The game's fast moving graphics, and pulsating soundtrack can get any players heart beating and blood flowing. While the challenge appears deceivingly simple, the player is quickly faced with an ever-increasing challenge that will quickly bring even the coolest character to a delightfully frustrating level of game playing frenzy. The pulsating soundtrack adds to the ever increasing sense of urgency, enhancing the fun. In addition to solo play, Color Rush also offers convenient Game Center compatibility, which allows players to check their own high scores against those of their friends, and other players around the world. Via Game Center, friends and family can be challenged to play, so everyone will know who the Color Rush master is in your group. "We had a lot of fun creating Color Rush, and even the developers who created the game found it to be a challenge to their gaming abilities," continues Eric. "We know players are going to play the game whenever they can. It's a great way to kill a few minutes while you're waiting in line, or to even spend an entire evening trying to set that new high score. Color Rush is the type of game they'll find themselves playing 'just one more time!'" Color Rush 1.0 is free, and is available worldwide through the App Store in the Games category. An Android version will be available in the near future. Founded in 2012, GameInLife was created with one aim in mind: to develop interesting and fun mobile games. We create well-designed, user-friendly and beautiful games for players of all ages. All Material and Software Copyright (C) 2016 GameInLife. All Rights Reserved. Apple, the Apple logo, iPhone and iPod are registered trademarks of Apple Inc. in the U.S. and/or other countries.